Germans are known to gripe about just about everything, but don't listen to them when they complain about their trains. Germany easily has one of the world's best and most efficient passenger rail systems. There aren't many places that it doesn't get to, and the trip will generally be comfortable, economical, and punctual. Europe in general has a high utilization of trains, and Germany is especially reliant on them. Other than the automobile, rail is by far the most common means of transportation. Although there are a few independent regional rail lines, the main passenger rail system in Germany is the Deutsche Bahn (DB, or GermanRail), also known colloquially as "Die Bahn". Over 4.5 million people a day use the DB's 29,000 trains serving over 5,500 stations along 35,000 km of track. The Deutsche Bahn was formerly a government corporation but is now completely privatized (although it is still owned entirely by the government.) It was created from the old West German Deutsche Bundesbahn (German Federal Railways) and East German Reichsbahn (Imperial Railways). Connections between the former eastern and western halves of the country have been upgraded and expanded, and high-speed lines now reach all of the major eastern cities. Nearly all of the roadbed in the eastern part of the nation has either been upgraded or junked. The DB was developing the world's first magnetic-levitation passenger train line between Berlin and Hamburg, but it was cancelled due to a number of political issues. But another maglev line, connecting Munich's central station and airport, is now being considered. Unfortunately, maintenance work and other factors has caused punctuality to suffer in the past few years. As of late, only 75% or so of trains arrive within five minutes of schedule. The DB and government are working on solutions to improve on-time rates. It's worth noting that Germany is a union country, and transport strikes (Streik) can occur at any time and for any ol' reason, although it is still a fairly rare occurrence and there is usually plenty of advance notice. 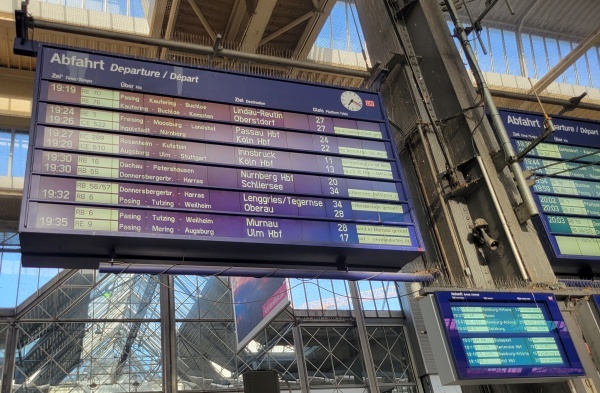 Still, travelers should be aware that even a short "warning strike" (Warnungstreik) in one city can ripple through the entire system causing long delays and even cancellations. On these days, be prepared to adjust your travel plans and wait longer than usual. An interesting note about these situations: since trains and punctuality are so important in the German world, conductors will hand-out official "certificates of train tardiness" (Bescheinigung über Zugverspätung) if a train is significantly late. You can use these as "excuse slips" for arriving late to work, school, or other appointments, or keep them as souvenirs of your encounter with European organized labor. Most of the rolling stock in Germany has been recently upgraded with fewer and fewer of the old hand-me-downs still around. But you will see many trains in big cities (especially the Frankfurt and Rhein-Ruhr areas) with exteriors covered by graffiti. Generally, it's mainly the lower-end local and regional trains that suffer from these problems and no matter what the exterior of the train looks like, the interior will usually be quite clean. Oftentimes, train sets will contain cars or locomotives from neighboring countries. If you're really interested in trains (or even marginally), I would recommend sitting on a platform at a major station for a while and watching the trains come and go. You will get to see all of the various types of trains and watch how precisely the system runs. I have done this many times and it still fascinates me just as much now as when I was a kid. IC/EC (InterCity/EuroCity) - These are high-quality express trains connecting the larger domestic destinations and hubs at speeds sometimes only slightly slower than the ICE. Trains usually run every hour or two and sometimes share alternating schedules with ICE trains. Many of these trains travel into adjacent countries as part of the EC (EuroCity) system. ICN, EN, CNL, NZ (InterCityNight, EuroNight, CityNightLine; Nachtzug) - Various overnight trains providing long-distance sleeping accommodations. D (Durchgangszug) - The venerable D-Zug is a fairly rapid long-distance train that provides connections on some of the lesser traveled routes or times. These trains now run almost exclusively overnight. IRE (InterRegioExpress) - IRE trains are express trains that connect the larger regional cities at regular intervals. RE (RegionalExpress) - The RE is a regional express train connecting medium-sized towns to the main rail hubs. RB (RegionalBahn) - The RB is the main local train in the DB arsenal and connects the smallest of towns to the RE system and main rail hubs. SE (StadtExpress) - A local train that connects medium and large cities to their outlying satellite towns. S (S-Bahn, Schnellbahn) - Suburban commuter rail service in and around major metropolitan areas. In addition to the above services, you may find an interesting train known as a "Taxi" or "Railbus" train. This is basically a bus on tracks and provides occasional service on routes that have low ridership. Just like buses, these trains usually only stop on request. 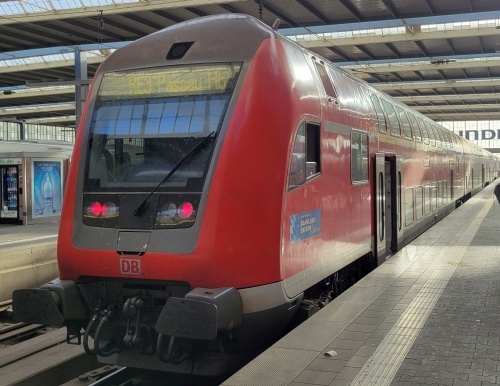 Relatively new to Germany are double-decker trains. These generally serve high-volume RE routes. Many regional trains have a special area for storing bicycles; those cars are marked with a large bicycle symbol on the outside. Long-distance trains (ICE, IC, and IRE) are usually white with red markings, while regional trains (RE, RB, SE, and S) are usually red with white or gray markings. On many local routes serving smaller towns, trains alternate which stations they stop at. Often, the first train on the line will stop at all stations, then the next train a half-hour or hour later will only stop at selected stops (maybe every other station, or every third one), then the following train after that will again stop at all the stations. Another stopping pattern is when two trains running a half-hour or hour apart have the same starting and ending stations, but the first train will stop at towns 1,3,5 and 7 along the way, and the second train will stop at towns 2,4,6, and 8. If you're headed to an out-of-the-way place, be sure to double-check that the train you plan to board will actually stop at your intended destination. Trains are divided into two classes-- first and second. The cars have a large "1" or "2" on the outside near the doors indicating which class they carry, and the first class section often has a yellow stripe along the top outside edge of the car. In general, all services available on the train are provided for both first and second class passengers. The main difference is that first class seats are a bit roomier and there are fewer of them. That, and the fact that first class rates are around 50% higher, means first class tends to be less crowded than second class. The ICE and IC/EC are the fastest trains on the GermanRail roster and are the services that tourists use the most. 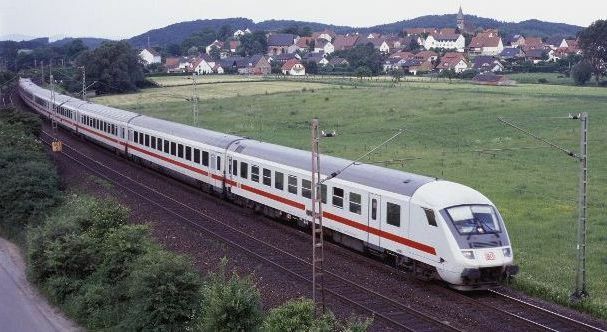 Due to legal issues (it's a long story), Germany fell a bit behind the curve in development of high-speed rail, with the 160 km/h IC/EC trains operating as the DB's fastest service until the ICE finally came online in 1991. However, the ICE (which is pronounced "I-C-E", not "ice") has rapidly made-up for the late start with trains that now reach 330 km/h, among the fastest in the world. The ICE has dramatically reduced travel time on nearly every long distance route. For example, the Munich to Hamburg journey, which took an agonizing eight hours in the old days, now takes a more tolerable six hours, and travel times along the Cologne-Frankfurt run, with trains hurtling along at the ICE's top speed, dropped from 2¼ hours to about one hour. Unfortunately, the ICE could shave even more travel time off the longer journeys, but due to political pressure, most ICE routes stop in some questionable "should-a-long-distance-train-really-stop-here" places. There are now three generations of ICE trains operating on over a dozen lines connecting all the major cities. The major routes run on special-built roadbeds that are straight and level and have welded tracks resulting in a smooth, quiet ride, while on other routes, new tilt-train technology has allowed ICE service on existing conventional tracks. The trains are pressurized to minimize the annoying ear discomfort to passengers caused by high speed travel through the many tunnels on the system. Besides being the fastest, the ICE is also the most luxurious of GermanRail trains. These trains feature adjustable cushioned seats, individual reading lights, piped music from armrest jacks (bring your own headset), conference rooms, public telephones, and fax machines. First class passengers also have video players at their seats. Although outgunned by its newer sibling, the IC is still an excellent service that supplements the ICE or connects some places that the ICE overshoots. Most all of the same amenities on the ICE are available on the IC as well. The EC is simply the international version of the IC. In addition to domestic service, various other high speed trains connect Germany to most neighboring countries. The Thayls connects Cologne to Paris and Brussels and provides a nice segue to the Eurostar to London. 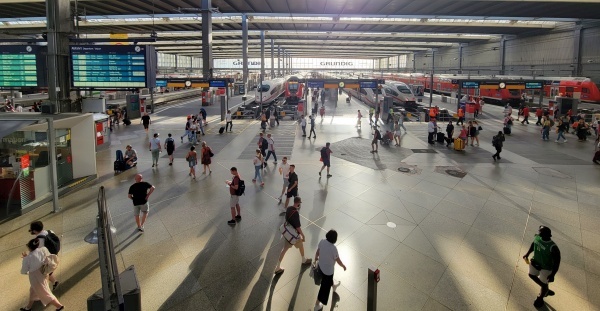 In conjunction with France's TGV service, two high-speed links connect Frankfurt and Stuttgart/Munich to Paris. 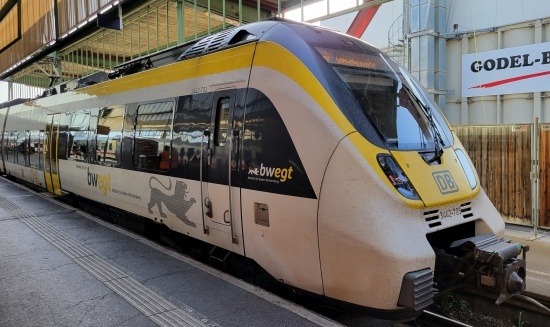 Some of the DB's own ICE routes cross into neighboring countries (Basel, Amsterdam and Salzburg are the major examples), and more international high-speed connections are in the works. There are many long-distance trains, both domestic and international, that operate overnight. Besides being a unique experience, night trains essentially add additional free time to your trip by allowing you to combine travel and sleep time. Many budget travelers use overnight trains entirely in lieu of hotels. 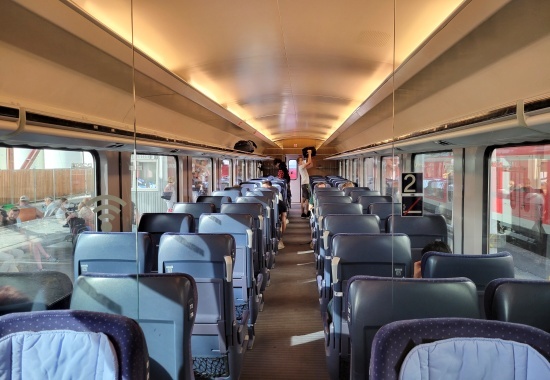 Recent years have seen the proliferation of dedicated "hotel trains" (NachtZug) connecting Berlin, Munich, Hamburg and Cologne, as well as some other specialty international hotel trains. These trains are basically full-service hotels on rails. They don't have regular seating, just sleeper compartments (see below for more information on these). These trains are a bit on the luxurious side with fares to match. Aside from the hotel trains, there are many standard trains that run overnight, mostly the "D-Zug" services. These trains usually have sleeper (Schlafwagen) and couchette (Liegewagen) berths available. Most overnight trains also have regular seating cars, but fewer of them, and some may not have any regular seating at all. 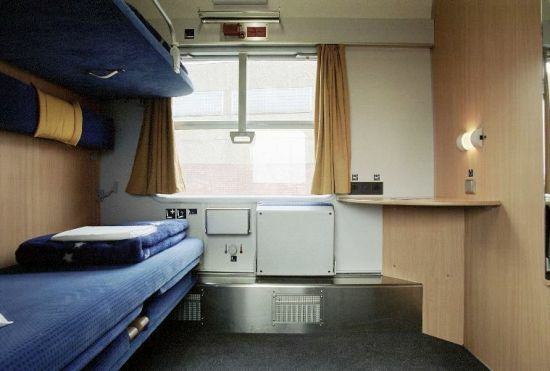 Sleepers feature private cabins with 1-3 bunks, mattresses and linens, and usually a small washbasin with hot and cold running water. There are sometimes also "deluxe" sleepers with cabins that also include a toilet and shower. Sleepers are full-service and attended by a porter who will provide whatever assistance you require. In most sleepers, you can get food delivered to your cabin, although expect to pay a rather steep premium for this service. On some trains, breakfast is included free. Sleepers are usually categorized as first class, which means you'll need a first class ticket, pass, or supplement to book them. Both types of compartments have room to store luggage and usually also have locking doors. The conductors and porters also act as watchmen to keep out the riffraff. It's a good idea, however, to sleep with any significant amounts of money, credit cards, or plane tickets either locked in a secure bag or in a money belt safely on your person. You should also consider locking or at least clipping your bags to the rails. If you don't want to spring for the couchette or sleeper, you can always try sleeping in the regular seats if the train has them. In open coach seating, you'll have the same dilemma as sleeping on an airplane-- seats that don't recline much and mysteriously get progressively more uncomfortable as the night drags on. You'll fare better in compartment seating. There, the seats usually can be pulled-out from the bottom. The back cushion then slides down behind the bottom cushion and the armrest folds up forming a cushioned horizontal surface. Pull two opposing seats out and you have a nice little bed for one, or pull them all out and have a nice queen-sized bed. Sleeper and couchette services require a reservation and carry a surcharge on top of the regular fare or rail pass day. The surcharge varies depending on the type of accommodation, class, and distance. For instance, couchette reservations start at around €20 for destinations in Germany, while sleeper accommodations start at €40. You can book sleepers or couchettes up to three months in advance, either through a travel service or at a DB station. While you can theoretically reserve at the last minute, either at the station or even on the train, it's best not to wait any later than a few days before your travel date to book as these services tend to fill-up, especially on weekends and holidays. If you have a rail pass that requires you to write-in the dates as you use it, and you use it on a direct overnight trip departing after 7:00pm, you are only required to fill-in the following day's date. With your ticket or pass and reservation slip in hand, head to the platform for your train. Once there, locate your assigned car and board it directly from the platform (more on doing that later). If you have a couchette reservation, you then locate your cabin yourself and settle-in. For sleeper reservations, you must check-in with the porter of the car where your cabin is located and they'll direct you from there. 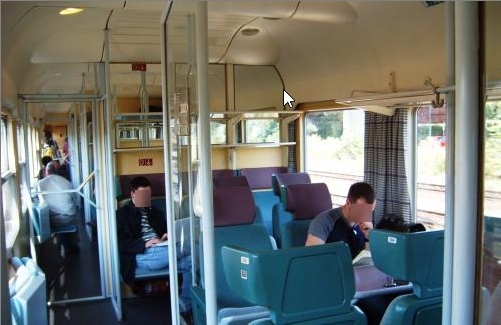 In both the sleeper and couchette cars, the conductor or porter will take your tickets and passport and keep it for the duration of the trip to avoid having to wake you for ticket or passport checks. You will get them back when you arrive at your destination. Shortly before arrival at your destination, you will be awoken by the conductor or porter. If you are disembarking at the last stop on the line (which is usually the case), you will typically be allowed a reasonable amount of time to get up, get ready, and get off, especially if the train arrives before 7:00am. There used to be a day not long ago when you had to purchase the massive timetable book (Kursbuch) or call the DB if you wanted to check train schedules without trekking down to the station. Nowadays, while the timetable tome is still available (€15 at any DB station), the Internet makes finding schedules much simpler (and free!) The DB has an excellent website-- probably the best in Europe, and in English no less-- from which you can get train schedules for all of Europe for any date and time. For most domestic and many international trips, once you've located your desired connection, you can then purchase and print your tickets. Be sure to include "Hbf" (the abbreviation for Hauptbahnhof) if you want the central station for a large city (e.g. 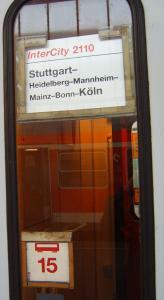 "Stuttgart Hbf" is the central station for Stuttgart). Berlin's shiny new Hauptbahnhof opened in 2006 and essentially replaced the Zoo and Ostbahnhof stations as Berlin's primary long-distance station. By the way, the "(Main)" in "Frankfurt (Main) Hbf" doesn't mean the "main" Hauptbahnhof (that would be redundant)-- it means it's Frankfurt on the Main River; there's another Frankfurt way over in eastern Germany on the Oder River, listed, of course, as "Frankfurt (Oder)". Remember that the date is written dd.mm.yy (e.g. Christmas 2010 is 25.12.10) and that time is on the 24-hour clock (e.g. 7:00pm = 19:00). If you are going to be using a rail pass or already have tickets, you can ignore the pricing information. You may be prompted to fill-in your age-- this is so the system can calculate the proper fare. Again, if you have a pass, you can feed it your pretend age. You may be prompted to pick a more specific station than the one you typed; if so, do your best to find what you're looking for. The DB timetables include local transit services as well, so the list may include bus stops, subway stations, or airports that closely resemble what you submitted. Over the past few years, many cool new features have been added to the website. For instance, there is now a feature to automatically create and download a calendar item for your electronic calendar. There is a section that shows you the services and a map of the station or a map of the route. And there's even a section that will compare the estimated time, costs, and environmental impacts of the various other means of transport for your journey. Of course, timetables are still posted in the station (see "At the Station" below). You can also get "quickie" schedules from the new ticket vending machines now in most stations. Like any major transportation service, the DB offers a myriad of tickets, fare schedules, and special deals. Even railway officials sometimes have problems navigating the Byzantine structure of the DB's ticketing options. To top it off, train travel in Germany, while a good value, is a bit pricey. Fortunately, most tourists shouldn't need to deal with this hassle as rail passes tend to be a much better deal and are usually purchased from the relative comfort of your home. There are a variety of tourist passes offered by GermanRail. These passes generally are a great deal and pay for themselves after a couple or three long-distance trips. The most popular is the GermanRail Pass. This pass, available for purchase only outside of Germany, allows you unlimited rail travel for 4 to 10 days (consecutive or non-consecutive) within a month. The GermanRail TwinPass is a discounted GermanRail Pass valid for two people traveling together. For travelers under 26, there's the GermanRail Youth Pass, which allows unlimited travel for one month. 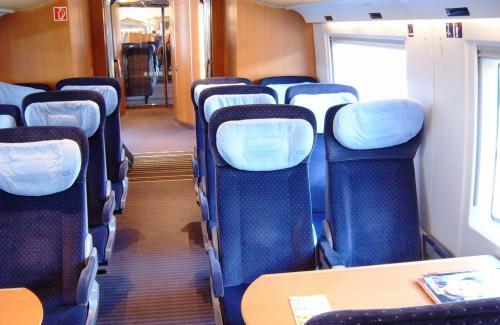 GermanRail also offers various fly-and-ride, drive-and-ride, holiday, and student passes. Check with your travel agent or on the web for prices and information on all passes. GermanRail passes are also valid for travel on DB buses (Bahnbus) and KD river cruises. If your trip includes other countries besides Germany, there are a plethora of Eurail international passes available that cover various combinations of countries and time periods. It might seem unwieldy at first, but you're sure to find a pass that fits your particular need. The Rail Europe travel service and Rick Steves' website (links below) have good comparisons to help you sort it all out. Before you decide to purchase a pass, you should do a rough calculation of the cost of individual tickets for your planned train travel by using the DB's website. If the sum total of point-to-point tickets exceeds the cost of a pass (which it probably will if you have a couple of long-distance trips), then the pass will be a better deal. Unfortunately, you often can't get international rates on the DB's site. However, since international trips tend to be fairly lengthy and expensive, a pass will almost surely be a better value in those cases. Passes also offer the most flexibility if that's important to you. Passes can be purchased either through your travel agent or on the web. There are a number of agencies dealing with rail passes; I've included links for ones I recommend at the bottom of this page. If you purchase a pass, be sure to read the directions that come with it and follow them precisely. Ignorance is not considered an excuse for not properly using your pass and you may be fined (or worse, publicly humiliated) if you don't follow the required steps. (That said, if you really did unintentionally forget to note the date and are sincere when explaining, they will likely just have you fill in the date with a minor admonishment.) However, those steps are usually quite easy. Most require that you have the pass validated by a rail official at the station before the first use. You do so by going to a ticket counter at the station and presenting the pass and your passport to the agent. He or she will then stamp the pass and fill-in the valid dates. You can do this just before the first time you use it or you can do it in advance if you like; just make sure to tell the agent your desired validity start date if you're not going to start using it right away. Then, each day that you use your pass (including the first day), remember to write the date ("dd.mm") in ink in the appropriate box on the pass before you board the first train that day. If you have any questions, ask at the information desk or ticket office in the station. Prior to 2002, most fares were calculated based on a flat, per-kilometer fare with surcharges tacked-on for faster services. Since the 2002 tariff reform and subsequent tweaking in 2003, the fare structure has become significantly more complex, much like the airline fare system (if you can call it a system.) Now, fares for each route and class of service are based on a combination of factors including a sliding-scale distance fare (longer distances are actually cheaper per kilometer now), speed and travel time on the route, and class of service. These "Relationspreise" constitute the standard fare (Normalpreis), against which an insane array of discounts are offered-- far too many to be discussed here. In short, it's best to just use the DB's website, automated ticket machines, or a ticket agent to find the best fare. The DB has numerous several special ticket offers including overnight fares, special weekend deals, and discount cards. Visit the DB's website or ask at the station ticket office for details on these. There are a variety of ways to purchase tickets nowadays; the method you choose will depend on your circumstance. The "old-fashioned" way: Go to the station, locate the departure timetable (large yellow schedules), and find the train that you need. Note the train number, departure time, and destination. Then go to the ticket counter (in larger stations, look for "Reisezentrum" signs) and give this information to the ticket agent. Many agents speak English, but if they don't, and you don't speak German, write the train number (e.g. "ICE 123"), departure time, destination, number of tickets (e.g. "2 Tickets"), and first or second class (e.g. "2. Klasse") on a slip of paper and hand it to the agent. Be prepared to wait in line a bit as the ticket counters at most stations are not as well-staffed as they could/should be (Germans don't work cheap after all.) Also, make sure that the line you are in will get you the service you need-- in some stations, there are still special lines for express service (just tickets- no reservations or information), and domestic (Inland) or international (Ausland) tickets. Some tips: I suggest that you use the DB's website to determine the approximate fares ahead of time. That way, you'll know if you are getting the correct fare when you purchase. If you have the time, I've also been told it's worthwhile to "shop around" at the station. Get a quote from one agent, then get a quote from a second agent. If they match, OK. If one's cheaper than the other, make sure you're getting the right ticket. If so, then go for the cheaper one. The "newfangled" way: If you're up-to-speed with modern technology and don't want to wait in line or just fear face time with the Teutonic train emissaries, you have two options. One is to book and print your own tickets online at the DB's sleek website (see the timetables section above). 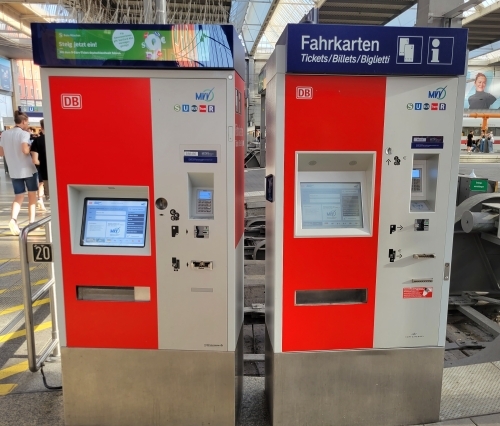 Or you can use the relatively new and increasingly prolific self-service ticket vending machines (marked "Fahrkarten", "Fahrausweis", or "Fahrschein") that you'll now find in most stations. In the past, you could only use these to buy tickets for journeys of less than 100 km. Nowadays, you can purchase tickets and seat reservations for any distance from these machines, as well as obtain schedules, purchase local transit tickets, and get other information. You'll often get a slight discount if you purchase your ticket or seat reservation from the machine. The machines are multi-lingual and touch-screen operated and are fairly intuitive. Some of the machines only take credit cards, others only cash, and some take both, so double-check before you start to make sure the machine will accept your payment type. If all else fails: As a last resort, tickets can be purchased on board the train from the conductor for a small surcharge. Note, however, that this is only possible on long-distance trains; most local and many regional and short-haul trains no longer have conductors. Be sure to approach the conductor before he finds you; otherwise, it will appear as if you were attempting to be a stowaway. 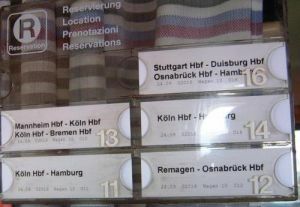 Tickets for trips on other European railway systems can also be bought at stations in Germany. Indeed, you can purchase tickets for trips between any two points in Europe (domestic or international) at any DB station. This is handy if you have a Germany-only pass and want to, for example, travel from Frankfurt to Paris. 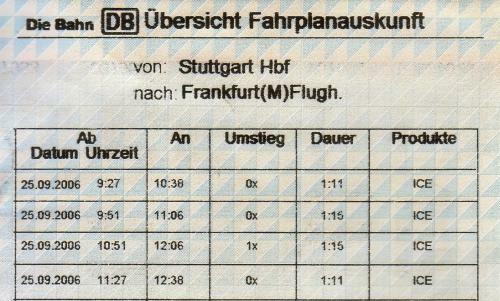 You can use your DB pass to get from Frankfurt to the border, but you'll need a separate ticket from there to Paris. You can buy this ticket in Frankfurt by simply explaining this to the ticket agent. They'll even figure-out which border crossing you'll be using so as to get you the right ticket. Tickets or passes only guarantee passage from one place to another; they do not actually guarantee you seated passage. In most cases, you should be able to find a seat without much problem. 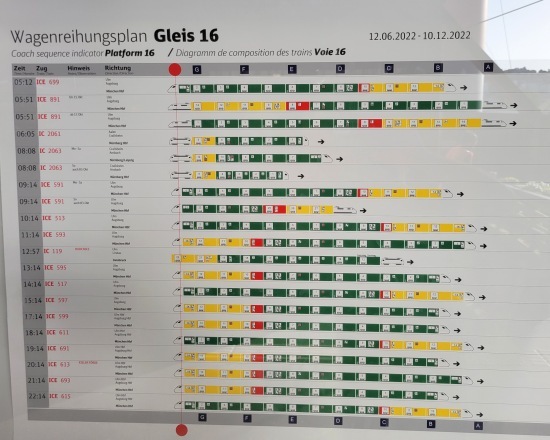 However, seat reservations (Platzreservierung) are recommended on the busier routes, especially on Fridays, Sundays and holidays, and are required on a few trains (noted with a bold "R" on the schedule.) If not required, these reservations are purchased separately from your ticket, although you can purchase them at the same time you buy your ticket and have the fee included, and doing so usually will get you a discounted rate. You can book seats up to three months before departure all the way up to the time of departure. When you purchase seat reservations, you have several options. First, you can specify Großraumwagen or Abteilwagen. The Abteilwagen has compartments that open onto a corridor along one side of the car. Each compartment has four to six total seats facing each other. The Großraumwagen is an open coach car with varying seat configurations. You'll also want to specify rauchen (smoking) or nicht rauchen (non-smoking). If you want a window seat (am Fenster), aisle seat (am Gang), or a table (am Tisch), be sure to specify that, too. See the section "On Board" below for information on claiming your seat aboard the train. The German word for train station is Bahnhof. If you're in a large city, you will most likely be using the Hauptbahnhof, or central station. Stations are usually located in the very heart of the city, except in small towns where they're often located on the edge of town. Large cities will usually have a number of suburban stations as well. Berlin used to have several main stations, with the venerable Zoo station serving as the major station in the western half of the city and the Ostbahnhof, which prior to 1998 had been called Hauptbahnhof, being the hub for the eastern part. However, a massive new central station for the entire city opened in May 2006 across the Spree River from the Reichstag on the site of the former Lehrter Bahnhof, relegating the other stations to mostly regional services. The five-level glass-shrouded Berlin Hauptbahnhof is the largest rail station in Europe with a train departing on average every 90 seconds. By contrast, many teeny-tiny villages have only a single trackside platform served by a handful of trains a day. Once you get there, you will find that the larger stations are self-contained cities. Most now feature a large shopping arcade with a wide-assortment of stores and restaurants that are open extended hours or even 'round-the-clock. Information and ticket counters are found in most stations of any significance as are luggage lockers. Larger stations usually also have banks and currency exchanges, luggage offices, post offices, public showers, and a traveler's aid service called Bahnhofsmission. A few even have an on-site hotel. Many stations are in historical structures and have been or are in the process of being renovated. The DB has a website that provides information on the largest 20 or so stations; see the web links at the bottom of this page. Timetables are prominently posted throughout the station. You will find two schedules: arrivals (Ankunft) and departures (Abfahrt). Departures are listed on yellow charts, arrivals on white. All trains arriving or departing that station are listed chronologically starting at midnight. Times are listed using the 24-hour clock (e.g. 13:00 = 1:00pm). Various symbols indicate the services onboard, reservation requirements, and days that train operates-- use the legend at the bottom to crack the code. Express trains are listed in red. The train number and the arrival or departure track (Gleis) number are also listed. In major stations, there will also be large electronic display boards showing the trains scheduled for the next hour or so and their status. Use these resources to determine which platform you need to head to for your train. Departure time and train number are listed at the left, followed by any special notes for the train (such as the location where the train will be divided and sent to different destinations), a list of destinations served by that train, and a graphical representation of the layout of the train with second class cars shown in green, the restaurant or bar car in red, first class cars in yellow, and sleeper cars in blue. 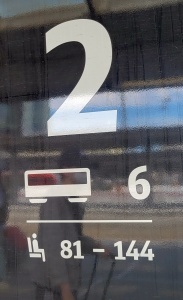 The white square on each car shows the car number, and symbols indicating specific other notes about each car (e.g. smoking, type of seating, etc.) are shown to the right of the number. Listed just above each car is its ultimate destination and along the top and bottom of the chart are letters which correspond to the lettered signs above the platform used to approximate where each car will stop along the platform. The orange dot shows your current position. Occasionally, the platform for a train may be changed at the last minute. This is usually announced via loudspeaker. If you don't understand the announcement, watch the reaction of the people waiting with you. If everyone grumbles and starts walking away, you can bet that they just announced a change, so scurry along with the herd. Such changes will also usually be posted on the main departure boards as well as on the platform indicator signs. For instance, if the sign at platform 4 lists your train but has an addendum reading "auf Gleis 12", then that means your train has been moved to track 12. New LCD platform indicator sign indicating that this is platform 1 and that the next train is the ICE 557 departing at 10:46 bound for Berlin Ostbahnhof over Cologne Messe/Deutz, Wuppertal, Hagen, Hamm, Bielefeld, and Hannover. Second class cars will stop in sections A and B, the restaurant car in section C, and first class cars in section D.
Just to keep everyone on their toes, cars are sometimes scheduled to be removed and switched to other trains en route (or just sidetracked altogether.) This means you have to verify that the car you are boarding is actually going where you want to go. You can use the aforementioned Wagenstandanzeiger to determine this ahead of time, or, when the train arrives at the platform, check for the signs on or near each door on the train that lists the train and car numbers, origin and destination, and intermediate stops. Older trains still use paper signs; newer trains have fancy electronic displays. Make sure you see your target listed on the car you board or you could very well wind-up on a different continent. If in doubt, ask the conductor. Car number and destination signs (left) indicating that this is car #15 on the IC 2110 headed from Stuttgart to Cologne over Heidelberg, Mannheim, Mainz, and Bonn. Class and seat numbers indicator (center) showing that this is a second class car with both smoking and non-smoking sections and that seat numbers 81-126 are on this end of the car. New electronic indicator (right) shows that this is second class car #22 on the ICE 511 from Cologne to Munich. The middle line has a scrolling list of the intermediate stations. Once you're ready to board, allow those who want to disembark to do so first, then hop on. If no one is waiting to get off the train, the door may not open-- look for a button or handle to open the door. Make sure you are at the platform well before your train's scheduled departure time. While some trains may have a lengthy stopover, especially at major stations or at the starting point for a line, most trains stop for just a couple of minutes. Connections are meticulously timed, so it is imperative that everything run on time lest a train-sized monkey wrench get caught in the cogs of the giant GermanRail machine. To wit, lollygaggers take note: if you're even a minute late, you will almost surely miss your train! The conductor will blow a whistle just before departure and may shout "Alles einsteigen!" ("All aboard!") The doors will close automatically shortly thereafter. Once onboard, it's time to locate a seat. If you have a reservation, you'll need to find your assigned seat. Seat numbers are fairly logical and are clearly posted. In open coach cars, the seat numbers will be on the rail above the seat. 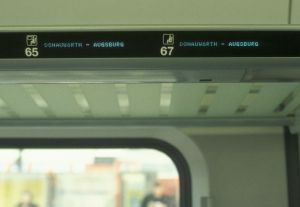 In compartment cars, the seat numbers are shown on the outside of the cabin. Reserved seats are marked with a small ticket in the little plastic doohickey next to the seat number. On newer trains, there is a small electronic display that shows reservation information. Ask the conductor if you need help locating your seat. If there is someone already sitting in a seat you have reserved, simply indicate that you have reserved that seat ("Entschuldigung, ich habe diesen Platz reserviert!") Most Germans will vacate the seat cheerfully (real or feigned) and wish you a good trip. Be sure to claim your seat as soon as you can-- reservations expire if you don't claim your seat within 15 minutes of departure. If you have not reserved a seat, locate a vacant seat and check to see if there is a reservation for it. If the seat has been reserved by someone, the reservation will indicate the part of the route for which the seat is reserved. If your journey doesn't include that section, you can have the seat. Otherwise, you may sit there until that segment is reached and the seat is claimed. Before sitting down, you should make sure it doesn't already have a squatter by asking nearby passengers if it is available ("Ist hier noch frei?"). Note that there are sometimes standing generic reservations for people with small children (posted as "Kleinkinder"), for handicapped people ("Schwerbehindert"), and seats that the railroad anticipates selling at the last minute (usually marked as "ggf freigeben", which means "surrender on demand"); you can sit in these if they're unoccupied, but if someone comes along saying they've reserved the seat, you'll have to move. You can store your luggage on the racks above the seats. There are also usually storage areas at the ends and sometimes in the center of the cars, although I wouldn't use these unless you have a chain lock or a clear view of the storage area. At the appointed time, the train will depart. The departure is usually so smooth that you may not even notice you're moving unless you're looking out the window. Once the train has been underway for a little while, the conductor will come through and ask for tickets. If you just boarded, present your ticket (and passport if proof of age or residency is required for your pass). The conductor will, in good German form, punch or stamp your ticket and return it to you. You will not need to show it again for the duration of your trip unless there is a staff change. Some regional and most local trains no longer have conductors-- passengers on these trains are on the honor system. You must purchase all tickets and reservations before you board these trains. Periodic spot checks are made and hefty fines are levied against those without valid tickets. Oh, and don't try to hide in the WC-- they don't find that amusing for some reason. Once you've settled-in and had your ticket checked, you can roam about the train (be sure to take your ticket with you.) Toilet facilities (WC) are located at the ends of the cars and thankfully are not emptied directly onto the tracks anymore, so you can use them at any time. However, you still can't use the water from the sink as drinking water. On the ICE and some newer trains, there are electronic displays at the ends of the coaches showing the train's itinerary, estimated arrival times, and the train's speed. Some of them even allow you to check schedules for connections (although I have yet to see one of these). Most higher-end trains have a bistro, buffet, restaurant, or lounge car serving a variety of foods, snacks, and beverages, including beer and wine. Some trains will have a small snack cart that passes through the cars. Wandering around the train will also allow you to interact with others and get that sense of belonging with the other travelers. I have had many an interesting conversation with people while waiting in line for a drink. Stops are announced shortly before arrival. If you miss the announcement (or just don't understand it! ), signs on the platforms will tell you where you're at. If your train has them, the electronic displays at the ends of the coaches will show the name of the upcoming stop as you approach it. Also, you will usually find an itinerary flyer near your seat listing the scheduled stops and available connections at each, as well as the services onboard. Make sure you are ready to jump off when the train arrives at your destination-- remember that at some stops, the train only stops for a minute or two. If you're not ready, you may end up taking an unscheduled diversion to Germany's Timbuktu. As the train pulls into your station, be standing at a door and when the wheels grind to a halt, open the door and leap off. To open the door, look for a handle or green button-- either should be fairly obvious. As the disembarking passenger, you have the right-of-way over people trying to clamber aboard, but be prepared to shove your way through any Teutons who aren't minding their manners. Once you get off the train, follow the "Ausgang" signs to leave the station. Large stations have multiple exits, so double-check to make sure you're headed in the right direction. If you are making connections, check the yellow schedules or electronic departure boards to find out which track your connecting train leaves from, then follow the signs directing you to that platform. Connection information is also usually announced on board the train as it approaches each station. In many cases, you may only have to cross the platform for your connecting train. Unfortunately, trains and stations are known hotbeds for thieves. However, you can reduce the possibility that your bags will spontaneously walk off by keeping them near you and in sight at all times, and by locking or clipping them to the rack. If it takes any additional effort to remove your bag, a ruffian will likely leave it and move on to easier prey. Otherwise, trains are relatively safe, although it is not recommended that you sit in an empty car at night, especially if you are a single woman. The DB operates regional bus service (Bahnbus) in the few areas served infrequently or not at all by rail. Most of these routes depart from the Zentralomnibusbahnhof (ZOB), or central bus station, usually located adjacent to a train station. The DB also operates the KD cruise boat service along the Rhine River from Cologne to Mainz. Rail tickets and passes are valid on both of these services.